this mod improves the HUD of Minetest and adds statbars for Hunger and Armor (hidden by default). Also it provides an API to add new statbars easily, see API.txt for more informations. Also its released bundled with hunger. Last edited by BlockMen on Sun Oct 18, 2015 17:06, edited 16 times in total. Very nice- keep up the good work! 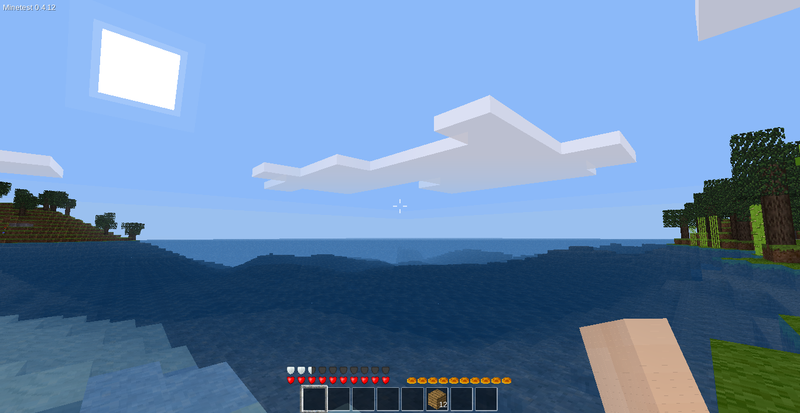 Thats gonna be laggy (see every "Drowning" mod). Last edited by PilzAdam on Sat Jun 22, 2013 17:15, edited 1 time in total. Location: where we don't speak english. All features I've been waiting for. It could be useful to have a function to change the properties of builtin HUD elements. I proposed this while implementing the align and offset. I prefer possible lags than having no control over drowning. When it gets read- and changeable by mods then a LUA-based drowing is ofc useless. Last edited by BlockMen on Fri Jun 28, 2013 21:26, edited 1 time in total. Let me know what food mod/s you would like to use and i will add support for it/these. BlockMen wrote: Let me know what food mod/s you would like to use and i will add support for it/these. i want to have mine supported. do you need me to say its' name out loud? It probably couldn't hurt to support the various food recipes in Moretrees mod. Mito551 wrote: i want to have mine supported. do you need me to say its' name out loud? I guess you mean dwarves? I added the food stuff of it. VanessaE wrote: It probably couldn't hurt to support the various food recipes in Moretrees mod. Added all i could find. Well I really was referring to the HUD part of it, because there's 3 different inventory mods and so I was wondering if he could create like a unified section. Like a worldedit / recipe / specialties all in one section. Slain wrote: i love every aspect of it so far. how here is the question. can you make an update to this mod to work with inventory_plus and armor mods? For me it works fine with inventory_plus. What issues you have? You mean an armor HUD that shows the status of it? Maybe I will add, but can't promise. keyxmakerx wrote: Well I really was referring to the HUD part of it, because there's 3 different inventory mods and so I was wondering if he could create like a unified section. Like a worldedit / recipe / specialties all in one section. And how should this mod interact with specialties? It has already a HUD, that shows the levels and does not effect this mod. An interaction with inventory mods? What would you expect (except armor status like suggested above)?